Update – 14 October, 2013 – I did it!!!! 68 km (42 1/4 miles) and 2048 m vertical (6719 feet) in 9 hours. Very happy with my time. Needless to say I can barely walk today. Thanks to everyone for your support. I raised over £1500 for my chosen charity, Little Hearts Matter. Update – 25 September, 2013 – I have been overwhelmed by the amount of support I have received. Two weeks into trying to collect sponsorship, I have now exceeded my target. Thank you so much for everyone who has sponsored me. Now all I have to do is run nearly 70 km in just over 2 weeks time! Yikes. 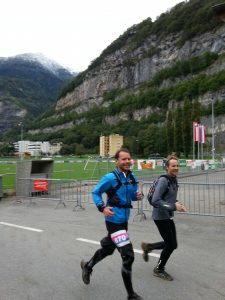 Back in September 2012, I found myself in Chamonix the same weekend as the Ultra Trail du Mont Blanc, a grueling race of around 168 km and 9600 m of positive altitude change which takes anything between 21 h to 46 h to complete. Rather than watch this and think “these folk are crazy”, for some reason it made me want to try ultra trail running. 4 weeks later and I found myself lining up to start the St Maurice Ultra (The Défis du Jubilé), a trail run through some historical biblical sites in the Swiss canton of Valais. Not quite the monster race that the Mont Blanc Ultra is, there are a number of stages ranging from 7 km to 68 km. Given the lack of training, and the fact that it was my first, I opted for the 52 km race. And amazingly I achieved my two goals…to finish and to not come last! Rather than get it out of my system, I now have a taste for ultra running, so this year on October 12th I will be going for the full 68 km race, with over 2000 m of vertical gain covering all seven stages in one day. And in doing so, I have decided to raise some money for a small charity in the UK, Little Hearts Matter, a worthwhile charity which offers support and information, and raises awareness of those affected when a child is born with a rare heart condition (such as Hypoplastic Left Heart Syndrome). If anyone out there would like to sponsor me for this good cause, you can do so via my Just Giving page. After a lot of miserable spring weather (really a continuation of the fierce winter we have had), we finally received some settled weather, warm temperatures and sunshine. I have been desperate to get out and explore the trails around Bernex and so when the sun arrived I was out of the door in a flash. Having spent 11 years living in Chatel, at the centre of this lively ski resort, it is really nice to move 25 minutes down the road. Bernex is a charming, traditional village and ski station nestled between the giant Portes du Soleil ski area and Lac Leman. And one of the best things about moving to a new area is exploring the surrounding countryside. 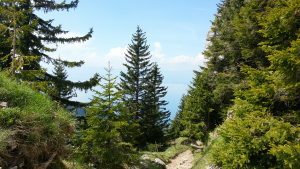 I took a hike behind my house in Charmet up to the Col du Creusaz, where stunning vistas of Lac Leman dominated the view. Walking around on the Thollon side I was surrounded by the impressive rocky cliffs of Mont Cesar and the Pic de Memises. Following signs up to the Col du Pertuis, I reached a lovely spot with views of the lake on one side, and views of Bernex on the other. From across the valley I could see storm clouds building so I thought perhaps it was time to get off the mountain. A walking sign pointed back down in the direction of Bernex. It said “l’échelle” which is French for ladder, and it did also mention “danger”. However, it was the official walking signpost so I figured it would be OK. THe path zig zagged down quite steeply and I assumed that this was the danger, and the zig zags must have resulted in the path being named the ladder. 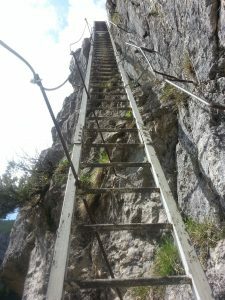 The Ladder – it really was a ladder! Then I got to the top of a cliff and encountered this! It turns out the ladder really is a ladder. And a 12m ladder at that. So there was nothing to do but to throw down my walking poles and get on with it. And what is the moral of the story? Although paths and places are often named after objects, from time to time you might have to take the walking signs literally! After reading this, I am pretty glad we live in the French Alps and not in the North American mountain ranges. We are sad to see the Chatel pool being demolished. However, this is making way for a brand new aquatic due to open in summer 2014. And if this video is anything to go by, it should be very impressive! For most skiers, the slow but steady arrival of the warmer spring weather means the inevitable reality of shelving ski dreams for another year and finding other ways to kill time until the season comes around again. For the more dedicated snow-hounds out there however, the spring months bring nothing less than glorious weather, shorter lift lines, fewer crowds and lower prices – all of which add up to ski nirvana, just as long as you know where to go. 1. Conditions – During spring, the snow on the slopes and around the resorts is prone to melting in the day and then freezing again overnight, which can in turn lead to some seriously unpredictable conditions in terms of ice, water and so on. Never take conditions for granted from one hour to the next. 2. Sunburn – It might still be nippy to a certain extent, but the sun is stronger and the snow still reflects a ton of harmful rays to hugely increase the likelihood of sunburn. In spring, put on the sunscreen you think you need and then add another layer just in case! covered up as much as possible. heads – never take a run for granted even if you’ve tackled it dozens of times in the winter. 6. Avalanches – Extreme perhaps, but spring can be peak avalanche season as the snow begins to melt, shift and give way under enormous weight. Always look into any avalanche warnings and never stray anywhere you’re not supposed to. out damaging UV rays and wear them at all times. level in terms of high-speed or extreme skiing – the conditions may not be up to handling it. 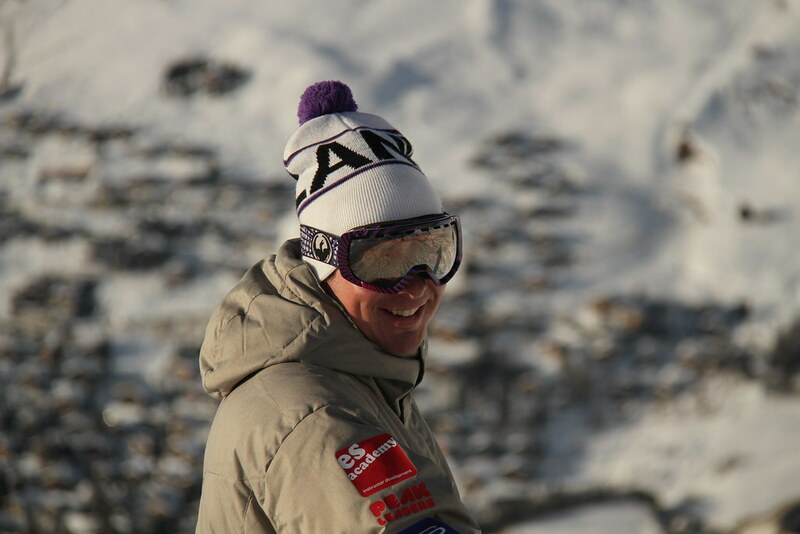 Some useful top tips from Alps2Alps the airport transfer provider for all your ski transfer needs. 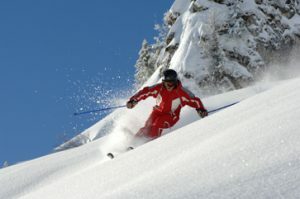 Self catered ski holidays often go hand in hand with self drive holidays. With snow falling again in the Alps and with a cold snap forecast for the UK, now is the perfect time to announce our Winter Driving Survival Kit competition, in partnership with the RAC. Whether you’re lucky enough to be living in the mountains or not, chances are that you’ll encounter some tricky driving conditions this winter. To help you out we’ve partnered with the RAC, the UK’s leading supplier of breakdown cover to offer you some quick tips to staying safe on the road as well as giving you the chance to win some great winter survival gear. i. Car Battery – Batteries are more liable to go flat during the winter months so check them regularly. ii. Coolant & Screenwash – Make sure both of these are topped up; the coolant needs to contain sufficient anti-freeze and the screenwash should be at the right concentration. iii. Tyres – Check that the tread on your tyres isn’t too worn. We recommend a depth of at least 3mm. iv. Wiper Blades – Examine them for damage and be careful when freeing them from your windscreen during icy weather as this can cause damage. 3. Adjust Your Driving Style – Ice and snow covered roads are much more sensitive so even if you’re not a naturally aggressive driver it’s still important to heed these tips. You need to accelerate gently and change up to a higher gear quickly to avoid spinning your wheels. If you suffer from wheel spin when trying to get moving, try changing into second gear. It goes without saying that there is much less grip on icy roads; in fact did you know that you may need up to 10 times the normal stopping distance between yourself and the car in front? Be wary about driving in the tracks of other cars – the snow is more compact and can be icier. If you do encounter a skid, drive into it to regain control and refrain from slamming on the brakes. For example, if the rear of your car is sliding to the right, steer right. And don’t be caught out by the sun – low winter sun combined with white snow can cause dazzling glare so always take a pair of sunglasses with you. Follow these tips and your chances of arriving at your destination safe and sound will sky rocket. However, you can never remove the risk of an incident completely so we recommend taking out breakdown cover, just to be safe. We’re offering you various different ways to enter – each way gives you one entry. Okay, so you’ve decided to take yourself off on your very first skiing holiday. You’re no doubt in for the most fantastic time, but before you go make sure you’ve got all those necessary essentials in place. 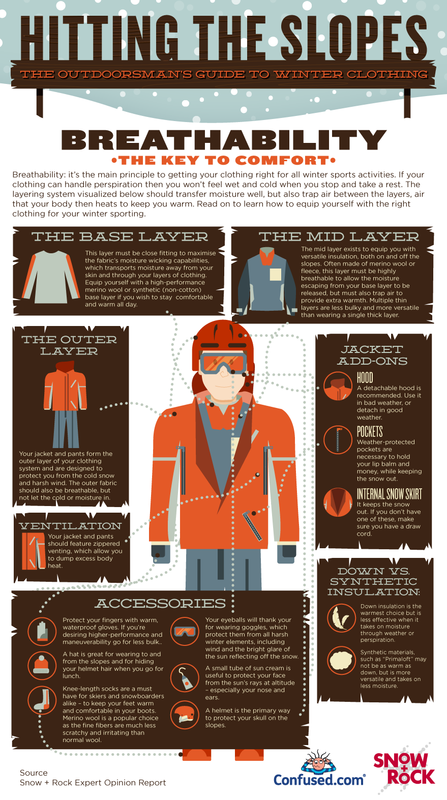 For a little ‘icespiration’ (see what we did there) here’s a quick guide of what to pack. You’ll need to wear lots of layers as it’s likely to be very chilly out there! Keep warmth and comfort at the forefront on your mind when packing, making sure you pop some items of breathable clothing in your suitcase to wear on top of the layers. Don’t worry about being too hot, you can simply peel off a layer if needs be. Remember, it’s easier to remove a layer than it is to add one. You will need to get some strong sun cream slapped on you. Don’t be fooled by the snowy weather. Even on cloudy days, you’ll need to wear the protective lotion to guard yourself against sunburn. Mountain sun, along with the reflection from the snow, is far more intense then normal. Get some good sun cream, of at least factor 25, packed. When it comes to ski gear, it can prove quite pricey, many skiers tend to rent their equipment instead. But if you want to purchase your own, but don’t want to pay over the odds, you might find some cheap ski gear in some shops, especially if there’s a sale on. But make sure you shop around. Second hand gear is another option, check out some online marketplaces, like eBay. You don’t need to take equipment, such as skis and ski boots, with you. Even the Mr Snow-it-alls out there know that it’s best to hire these in resort. 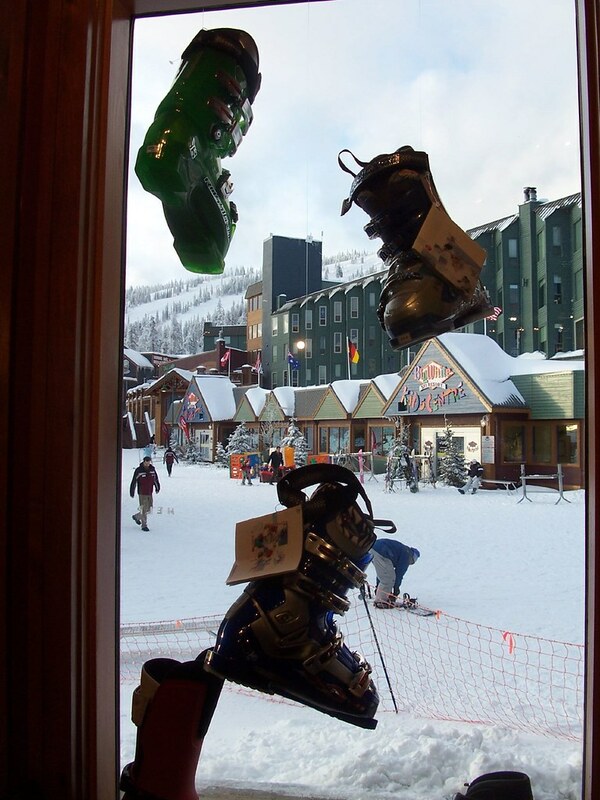 And remember, the ski boot is the most important item of ski equipment, so make sure the boots fit your feet nice and snugly. Comfort is key. Follow our above guide to packing and you can’t go wrong. Whether you’re going to be skiing in Meribel, hitting the slopes of Austria or heading to Canada, it’s vital you pack everything you need to. If not, you could end up spending more time in the shops than on the slopes. Happy skiing! Located in the Northern French Alps, close to Lac Leman, the Portes du Soleil is the largest linked ski area in the world. Created 40 years ago, this giant ski area straddles the French/Swiss border and brings together 12 resorts in both countries. The international flavour of the domain means that you can start the day eating croissants in France, and lunch on the slopes in Switzerland eating Rosti! The French resorts which make up the Portes du Soleil are Abondance, Avoriaz, Châtel, La Chapelle d’Abondance, Les Gets, Montriond, Morzine, Avoriaz, St Jean d’Aulps and the Swiss ones are Champéry, Morgins, Torgon, Val-d’Illiez – Les Crosets – Champoussin. The snowy slopes of the ‘Ludoffaz’ in the centre of the village are the ideal place for the whole family to try a huge range of wintersports activities. Everyone from toddlers to grown-ups can try skiing and snowboarding in an environment where safety comes first. For more thrills there’s sledging (alone or in a chain! ), rubber-ring sliding and airboarding for a no-holds-barred ride! For pure enjoyment there’s a ski lift and magic carpet to take you straight back to the top! Inspired by Northstar Resort in California and developed by Jake Burton… yes, that Jake Burton ! 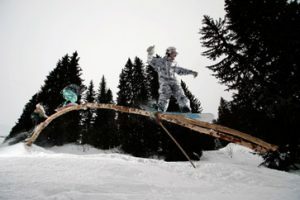 Hidden routes lie at the forest edge which lead to the secret log cabin where you can carve your own message – chances are you won’t find this cool new riders’ retreat on your first (second or third) run down! The new 6-man Crêt Béni chairlift on the north face of Mont de Grange leads to the plateau which is ideal for beginners. More experienced skiers can rejoin the resort far below at the bottom of the Cerf piste. All visitors should keep an eye out for the wild deer which roam the nature reserve on the slopes of the Abondance valley. 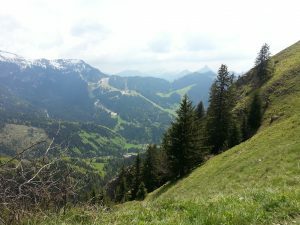 The Happy Park is on the Cornebois (Linga – Pré-la-Joux – Plaine-Dranse) at 1800m – 2000m. A playful and educational discovery route for 5-12 year-olds to do with their skis on. Pure fun with red Indians and trappers to see and bumps, woops and raised bends to tackle. Budding skiers can have their faces painted by the red Indian-entertainers near the teepees half way round the course. For a perfect end to your visit head for the Trappers’ cabin to attempt the games and musical challenges! 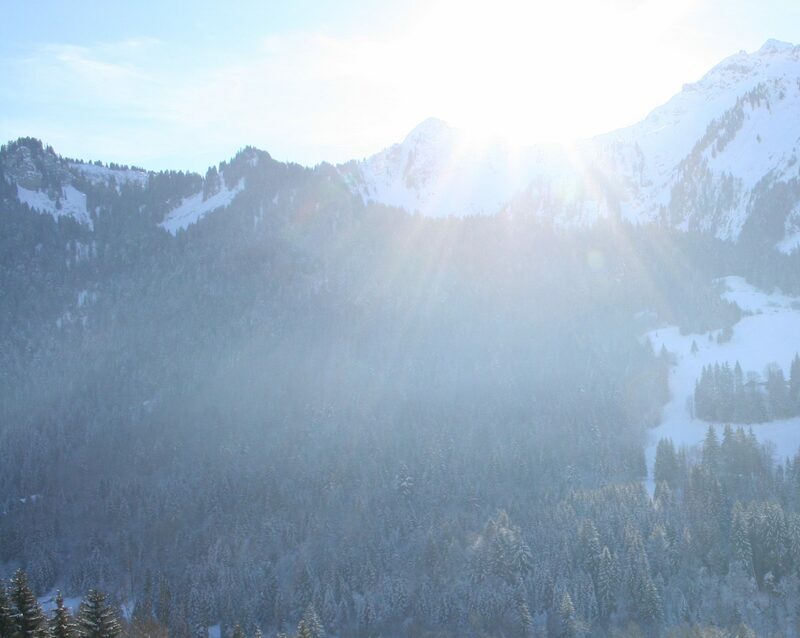 Montriond is home to one of the longest runs in the Portes du Soleil: Abricotine. Starting on the peaks marking the French-Swiss border, the piste travels over 8km before arriving at the foot of Ardents cable car. With its blue and red sections Abricotine can be tackled by most skiers; it also has plenty of surprises to keep you focused. From the highest point in the Morzine-Les Gets ski range, the Arbis run offers skiing for all abilities and breathtaking views! Link it with the Lievre and Retour des Nants pistes and you’ll be back in the centre of Morzine having covered 8km and a 1000 m descent in one go! The Roc d’Enfer circuit in Saint Jean d’Aulps is more than 20km of pure pisted pleasure! Departing from the Col de Graydon there’s also a walk around the fabulous Roc d’Enfer with breathtaking unspoilt scenery to explore full of spruces and hamlets. Quite simply a Portes du Soleil classic. From the Ripaille T-bar ski down this long run that sweeps past farms lying below the stunning Dents Blanches rockface. It’s so tranquil you almost wish it would never end…anyone in search of fresh tracks will find all the untouched powder they’re looking for on the edge of the slope. From the centre of Morgins village take the chair up the mountain which will drop you off slap bang in front of the Dents du Midi peaks before you can say ‘abracadabra’. The blue (which is in fact a red!) leading back down to the resort is floodlit 2 nights a week so you can ski underneath the stars…ski touring fans take note: Friday night is traditional climb night! Champoussin’s Aiguille des Champeys is a firm favourite for those in search of powder – whatever their level. With its steep ‘n’ deep couloirs and enticing untracked snow at the piste edge there’s a slice of happiness there for all freeriders! Accommodation wise, the Portes du Soleil has property for all occasions – from traditional chalets in the beautiful mountain villages, to ski in/ski out apartments in the purpose built high altitude resort of Avoriaz. We have a huge range of self catered ski accommodation to suit all requirements available to rent in many of the Portes du Soleil’s major resorts. Follow the links to discover our accommodation in: Abondance, Avoriaz, Châtel, La Chapelle d’Abondance, Les Gets, Morzine, Avoriaz, Champéry, Torgon, Val-d’Illiez – Les Crosets – Champoussin. The Portes Du Soleil ski area has an enviable snow record. Its proximity to Mont Blanc and Lac Leman creates a micro-climate which means that the area tends to get significant snowfall from the start of December through to when the lifts close in late April. Because most of the lower slopes are pasture land, depths of 10-20cms are often all that is required to open the pistes, compared with higher altitude resorts where a metre or so is needed to cover the rocks. Those in the know have long since discovered that the Northern French Alps have some of the best and consistent snow conditions to be found anywhere across Europe. 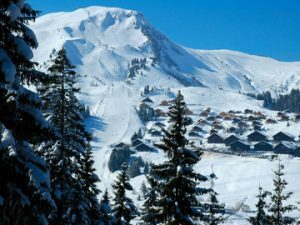 Over the last few seasons, the Portes du Soleil has had fantastic conditions while at the same time the higher and so called “snow sure” resorts in the south of France have been sorely lacking in snow. Come and find out what all the fuss is about…! Download the Portes du Soleil Piste Map (it’s a big file).